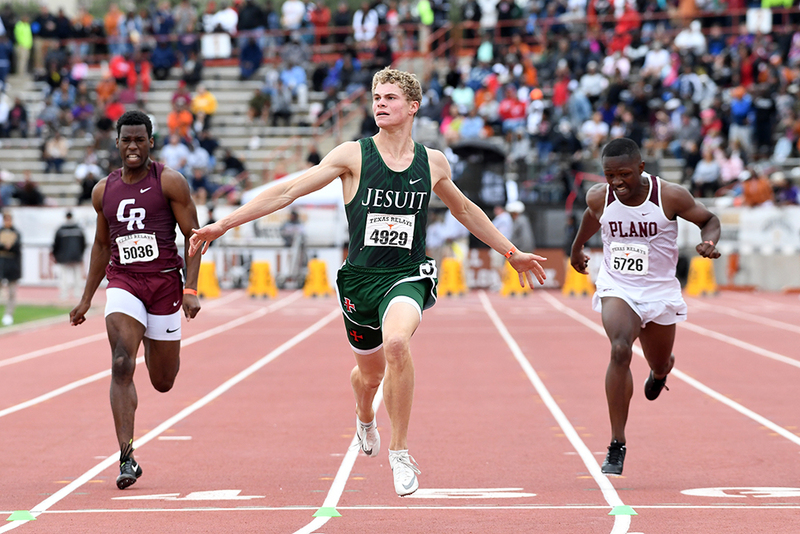 AUSTIN, TEXAS, March 28-30—When the wider track & field world first became aware of high schooler Matthew Boling (Strake, Houston), he seemed like a pretty promising prospect in the 400 who could jump a little too, running 47.38 and jumping 23-11 as a soph in ’17. Last year he uniquely earned No. 5 All-America status in both events, and with marks of 46.15 and 23-11½ (plus 24-2¾w), his future as a Georgia Bulldog seemed to be in the quartermile. But March 2019 has marked the unveiling of Boling 2.0. After years away from the short sprints, he suddenly became a hot topic when he burned up nation-leading marks of 10.22 and 20.58 at the Texas Southern Relays. He also burnished his jumping cred at two other meets by sneaking past 25 feet with PRs of 25-½ and 25-2½. What to do for an encore? He headed to the most prestigious meet in the state, the Texas Relays, and delivered a master class in multitasking. On Friday night, he leaped past a lot of sand as well as history, opening at 25-7½w before reaching No. 7 on the all-time high school list with a 26-3½. Less than 24 hours later, a stunning bolt from 5th or 6th up to an at-the-line 1st gave his 4×1 teammates a 40.86 victory (winning by a mere 0.007). Add in a dominating 10.20w win in the 100 and his place in the athletic lore of a state with plenty of it was secured. 100(2.2): 1. Matthew Boling (Strake, Houston) 10.20w (10.21wh). Div 1 100(1.5): 1. Ryan Martin (Stafford) 10.37. 800: 5. Crayton Carrozza (St Stephen’s, Austin) 1:50.64 (9 days too old to be eligible for Texas HS season). 2000St: 1. *William Muirhead (Lovejoy, Lucas) 6:03.19 (HSL). 110H(2.5): 1. TreVon Mays (Spring) 13.82 (13.78wh). 4 x 100: 1. Strake 40.86 (Boling); 2. Duncanville 40.86; 3. Poly, Long Beach, Ca 40.91. 4 x 200: 1. Dunne, Dallas 1:25.54. Div. I 4 x 200: 1. DeSoto 1:25.81;… dnf—Lancaster, Tx. 4 x 400: 1. DeSoto 3:12.90. SpMed: 1. Poly, Long Beach, Ca 3:28.31. HJ: 1. **Eli Stowers (Guyer, Denton) 6-10. PV: 1. Max Manson (Monarch, Louisville, Co) 17-0; 2. Jacob Herrscher (Greenhill, Addison) 17-0. LJ: 1. Boling 26-3½ (HSL) (7,11 HS) (25-7½w, 26-3½, p, p, p, p). SP: 1. *Jeff Duensing (Esperanza, Anaheim, Ca) 65-3; 2. Patrick Piperi (The Woodlands) 64-10¾. JT: 1. *Sam Hankins (Manhattan, Ks) 207-7 (HSL). 100(1.8): 1. De’Anna Nowling (Calababas, Ca) 11.43; 2. Kenondra Davis (Trimble, Ft Worth) 11.50. 3200: 1. **Brynn Brown (Guyer, Denton) 10:21.98. 2. *Jayla Hollis (DeSoto) 13.83. 300H: 1. **Jalaysi’ya Smith (DeSoto) 42.14(HSL). 4 x 100: 1. DeSoto 45.69. Heats: IX–1. DeSoto 45.07 (HSL). 4 x 200: 1. Lancaster 1:38.27; 2. DeSoto 1:38.48. Heats: II–1. Desoto 1:38.04. 4 x 400: 1. DeSoto 3:39.81 (HSL). 4 x800: 1. DeSoto 9:14.70; 2. Flower Mound 9:20. SpMed: 1. The Woodlands 4:00.12; 2. Scripps Ranch, San Diego 4:00.40; 3. DeSoto 4:00.63; 4. Dana Hills, Dana Point, Ca 4:02.55. HJ: 1. *Rachel Glenn (Wilson, Long Beach, Ca) 5-8½; 2. Nissi Kabongo (Liberty, Frisco) 5-8½; 3. *Danielle Munoz (Cinco Ranch, Katy) 5-8½. PV: 1. Gennifer Hirata (Stafford) 14-0; 2. Riley Floerke (Gregory-Portland, Portland) 13-6; 3. Chloe Cunliffe (West, Seattle, Wa) 13-6; 4. Kaili Thompson (Warwick Valley, Warwick, RI) 13-6. LJ: 1. *Claire Bryant (Memorial, Houston) 21-2¼w (20-8¼); 2. Jasmine Moore (Lake Ridge, Mansfield) 20-10¼w (19-7¾); 3. Ameia Wilson (Danville) 19-6. TJ: 1. Moore 43-5 (f, 42-6¼, 42-8¾w, 42-6½, 43-5; f). SP: 1. *Kiana Lowery (Klein Oak, Spring) 45-2¼. DT: 1. *Chrystal Herpin (Dawson, Pearland) 160-5. Since 1986, Lee Nichols has been the Rockdale (Texas) High School record holder in the mile and 2-miles. He followed those feats with a brief and highly undistinguished tenure with the Texas Longhorns. 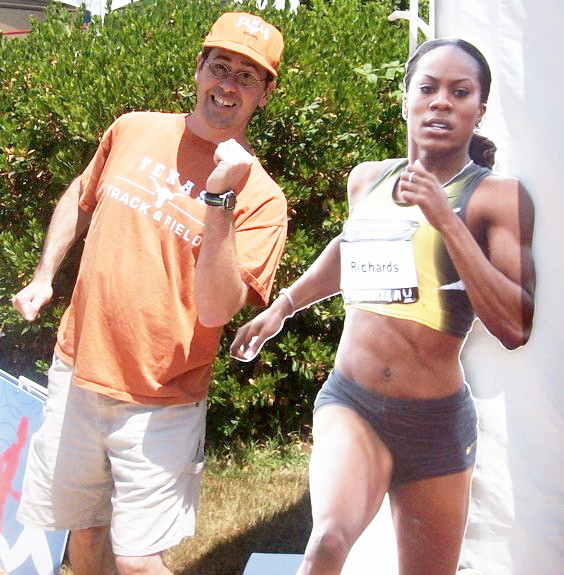 He has been writing for Track & Field News since 2004. When he's not writing about track, he's either writing about or drinking craft beer and watching Tottenham Hotspur play soccer.